An early guest Saul Nasse of the BBC described Noi Naro as being a ” lovely fusion of old and new”. This remains an apt description for this century old Portuguese era heritage home in North Goa. Noi Varo is redolent with heritage ambience and yet very contemporary. The interiors combine handcrafted furniture and lighting installations with state of the art technology and contemporary design. With three luxury suites, 3 luxury bathrooms attached to the suites, 2 sleeping lofts and several common indoor and outdoor lounging spaces, including a river view restaurant and exclusive event dining space, Noi Varo is perfect for singles and couples or a group of a maximum of about 10 people. More can muck in if privacy is not an issue. Superb location within easy driving distance of the best beaches and nightlife in North Goa. 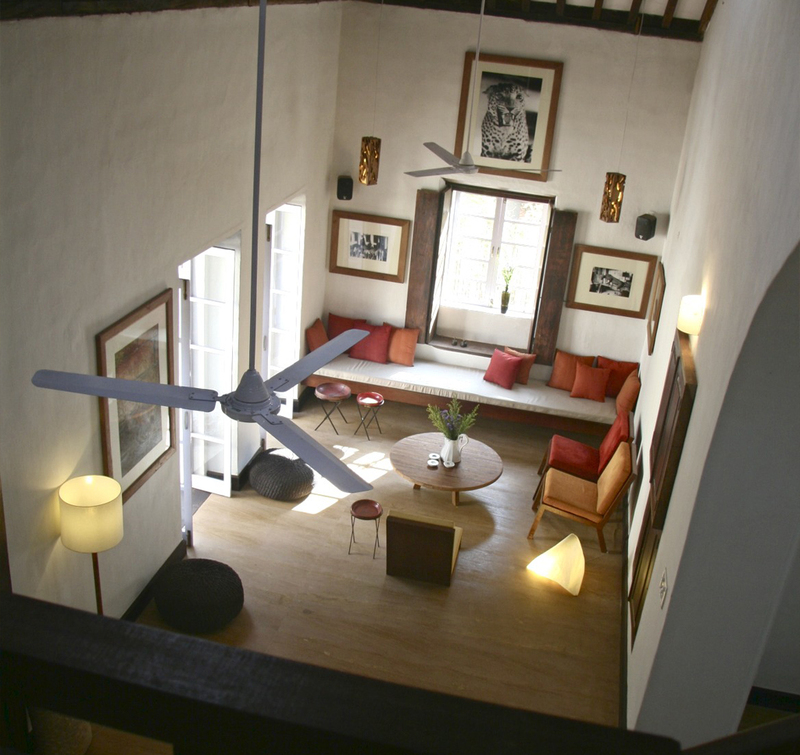 The interiors have not lost their old world charm as in most heritage resort renovations. Great in house gourmet food cooked by a resident chef and served by a butler. Not a good all night party place. While the thick heritage walls allow you to play loud music indoors as late as you want, partying by the pool is not an option after 10 pm. Not walking distance from the beach. Apartment sized super luxury suite with bedroom and attached lounge and huge bathroom with 2 rain showers and private verandah sit out. The lounge has been recently re-designed to also serve as a co-working space in case it’s not occupied by honeymooners! Apartment sized super luxury suite with bedroom and attached lounge, bathroom and loft with double bedroom. Ideal for couple with teen aged children. The lounge has been recently re-designed as a co-working space. Ideal for couples or singles. Huge bedroom with lounging space. Gigantic bathroom as big as most luxury hotel rooms. No attached bathroom and limited privacy. Can only be used by groups who rent the whole villa. Cannot be rented separately. With our recent emphasis on residential co-working it has been redesigned as a business centre, with printer, xerox etc.